Thank you for choosing Potassium Iodide by Lidtke. We sincerely wish the best of health for you and your family. 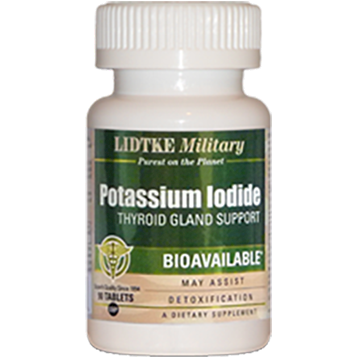 Lidtke Military Potassium Iodide may be used to promote beneficial levels of iodide in the thyroid gland. * Iodide is readily taken up by the thyroid and may assist the body's detoxification process. * Lidtke stands behind each product and guarantees customer satisfaction. Guaranteed 10 years from date of purchase. Superb quality since 1994. Bioavailable. Directions: (Adults) Take one (1) tablet or as directed by your doctor. This product is not intended to be used as a daily supplement for more than ten (10) days without first consulting your doctor. No added gluten, yeast, wheat, corn, soy, dairy, eggs, tree nuts, peanuts, fish, shellfish, salt, sugar, artificial color or flavor, or preservatives. Non-GMO . Warning: Keep out of reach of children. If you are pregnant, lactating, taking any medications or have a medical condition, such as an iodide allergy or thyroid condition, consult your doctor. Discontinue use if adverse reaction occurs. Do not use if seal is damaged or missing. Keep lid tightly closed. Keep in a cool, dry place.